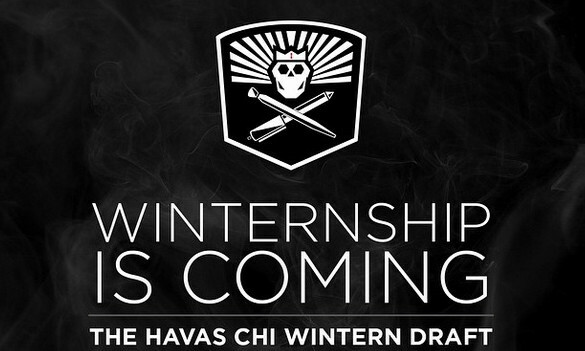 Channeling the popular HBO’ TV series Game Of Thrones and House Stark’s battle-ready family motto “Winter Is Coming”, Havas Media’s Chicago office recently announced its 10-week winter internship programme, titled ‘Winternship’. With just seven spots open, Havas Media rejected the traditional recruitment approach and instead modelled the intern hunt as a competition via Snapchat and Instagram, urging applicants to compete and prove their worth. The hashtag #winternshipiscoming was used as well for all competition submissions. On its official Twitter @InternDraft, the team tweeted out several dramatic (bloody swords and the like) posts to encourage more ‘warriors’ to join them, or rather to “claim the throne”. The media company took it a step further by dividing its employees into seven houses a la Game of Thrones, prompting applicants to pick their house wisely and prove their allegiance in the first round via Instagram, tagging @havaschi along with the hashtag for their submissions. Once finalists were shortlisted by the respective houses, they were issued a SnapChat challenge with just 24 hours to prove why they should be chosen. For its summer internship recruitment, Havas Chicago had used the #iamheretotakeyourjob hashtag as well, reflecting the agency’s clever use of social media to spice up the mundane recruitment process. The hunt for Winternship has since been closed and the successful Winterns will be announced on November 24. According to pictures circulating online, the letter "f" was missing from the words "Cathay Pacific", resulting in the final spell..
As its new strategy, Burberry aims to expand its efforts towards reusing, repairing, recycling or donating its unsaleable products..